A new high-resolution 4K TV may bring crystal clear picture quality to your home entertainment system, but great sound is just as important as a great picture. But getting the perfect sound system can be complicated, with the need to properly position speakers and woofers to get the theater quality surround sound you want. Soundbars, which pack multiple speakers into a single unit, eliminate some of the complications, but even they usually need a supplemental woofer for the best sound. But Samsung is trying to give us the best of both worlds with the MS750 Sound+ Soundbar ($699). This 5-channel, 11-speaker unit has three wide-range tweeters and two vertical wide-range tweeters, but it stands out because of its six woofers. That gives this soundbar powerful bass performance even without a separate subwoofer — much better than you'll find on comparable soundbars like the similarly priced Sonos Playbar or Playbase. Still, if you want full-on 5.1 surround sound performance, you can add an additional subwoofer unit — the $499 W700 — to get bass as low as 27Hz. The MS750 is 4K ready with Ultra High Quality 32-bit audio, but it should make even more modest audio sound better with upscaling technology. UHQ offers audio quality that closely matches the original source — and though you still won't get perfect sound from lower quality sources, it should sound better than it would on your average speaker. And if you want to play content from something other than your television, you can use Samsung's Multiroom App (for Android and iOS) to stream any source from your smartphone. While the MS750 is certainly overkill for a streaming speaker, it will give you room-filling sound — perfect whether you're entertaining or just want some tunes to keep you company while doing the housework. 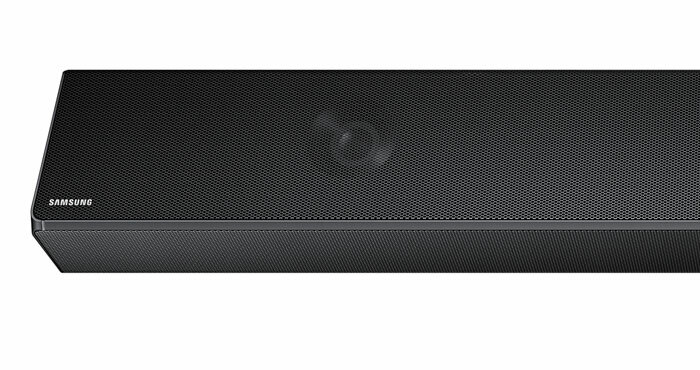 As far as looks go, the MS750 is about what you'd expect from a soundbar: a long rectangle designed to rest under your television without standing out. It can be mounted directly to Samsung UHD TVs for a clean look, and a single power cord can power both television and soundbar so you don't have an ugly mess of cables. A 4K passthrough lets you link your TV, soundbar, and UHD Blu-Ray player for the simplest possible 4K setup — again, without a mess of wires. If spending $700 on the MS750 is a bit out of your budget, the MS650 ($447.99 on Amazon) offers good sound — though you won't get the deep bass you will with the MS750 — for just $449. It's a decent compromise for solid sound that's easy on your budget. But if you're looking for a high-end system with simple setup, the MS750 is available at retailers now.